Fall is here, and those wonderful colors are painted across the landscape again. The leaves are changing and so is the temperature, which plays a large role in what to do with our trees at this time of year. There are several tree species that should not be trimmed until after the temperature drops below freezing. Some trees can be trimmed any time of the year, but major pruning should be done in the spring if at all possible. We strongly encourage not trimming fruit trees in the summer due to the presence of fire blight in Colorado. Fire blight is a devastating fungus that makes limbs look as though they were burnt. It often affects various types of apple trees. During winter months this fungus is dormant, although, extra care should still be taken to prevent it from spreading. Disinfecting tools before and between each cut will greatly minimize the risks of trimming. Heavy pruning should still wait until spring, just before the thaw. It is also best to trim pine trees after the temperature drops below freezing. The mountain pine bark beetle and the ips beetle are also dormant during this time. These beetles are attracted to weak or stressed trees as well as freshly cut slash. Any freshly cut material should be removed from the property as soon as possible. We have seen several cases of the ips beetle in Colorado Springs and their effects are devastating to several pine and fir species. If you suspect your tree has insects in it, (woodpeckers are a dead give away), have it inspected by an arborist as soon as possible. Once they kill off one tree, they will move to another. As always, the best way to protect your trees is to be informed. Ask a professional or read up and do your homework. The Colorado State University forestry website is a great site full of useful and accurate information. 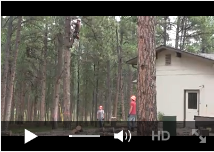 We also offer tree inspections and risk assessments at no charge to the customer. Its all a part of our dedication to conservation.